Dr. Tim Inglis, from UWA's Schools of Medicine and Biomedical Sciences, presented the results at the International One Health Congress in Saskatoon, Canada and said the FAST workflow promised to change clinical practice. 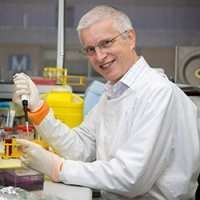 "In just over a year since the UWA team published this method in Scientific Reports, we have chalked up a long list of tests for specific microbe and antibiotic combinations, attracted interest from the biotech industry, worked out how to deliver these tests safely in a diagnostic laboratory, and run our first pilot trial on clinical specimens," Dr. Inglis said. "We were surprised how well FAST works with every drug-bug combination we've tried. "Different combinations of antibiotics, bacteria and coloured dye were analysed to evaluate performance of the FAST test method. We've been able to show that FAST really works." Dr. Inglis said the remaining obstacles were concerned with meeting the regulatory standards for clinical tests. "This is a game-changer, so we want to bring FAST into use as quickly as possible. But it will be the regulators who tell us when that will be," Dr. Inglis said.